TORONTO (Reuters) - The Canadian dollar weakened to an eight-week low against its broadly stronger U.S. counterpart on Thursday as oil prices fell and the Federal Reserve left intact its plans to gradually raise interest rates. 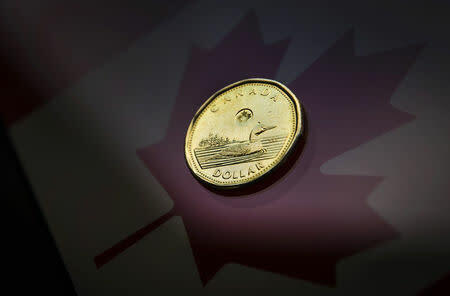 "It didn't raise rates today but it seems like they are still on the path to higher rates ... which causes the loonie to decline a little bit," said Hosen Marjaee, senior managing director, Canadian fixed income at Manulife Asset Management. Higher U.S. interest rates could reduce investor incentive to buy lower-yielding Canadian bonds. The gap between Canada's 5-year yield and its U.S. equivalent widened by 3.1 basis points to a spread of 63.5 basis points in favor of the U.S. bond. The U.S. dollar <.DXY> climbed against a basket of major currencies, while U.S. crude oil futures settled 1.6 percent lower at $60.67 a barrel as investors focused on swelling global crude supply..
At 3:30 p.m. (2030 GMT), the Canadian dollar was trading 0.4 percent lower at 1.3163 to the greenback, or 75.97 U.S. cents. The currency touched its weakest level since Sept. 10 at 1.3183. Canadian housing starts rose in October to a seasonally adjusted annual rate of 205,925 units from September's upwardly revised 189,730 units. Economists had expected starts to rise to 200,000. Canadian government bond prices were mixed across a slightly flatter yield curve. The 10-year rose 1 Canadian cent to yield 2.537 percent.